When the new school year starts, we know that mothers all over scratch their heads trying to come up with new ideas about what to pack in their kids in their lunch boxes. So, we thought we this might help the cause. As far as drinks are concerned, water is the best choice every time. We believe strongly that teaching our kids to get into the habit of drinking sweet beverages will only set bad habits for later. However – if your child does a lot of sporting activities and is out in the sun then you may need something that will quench his/her thirst more efficiently and also replace lost electrolytes. In this case, a plain coconut water or one with a splash of fruit juice would be very useful. It has an acquired taste but if you can get your kids to enjoy it, then its miles ahead of any of the sugar and additive packed energy drinks on the market. Fruit & Vegetables are where you need to start and kids like to have a selection of things to nibble. 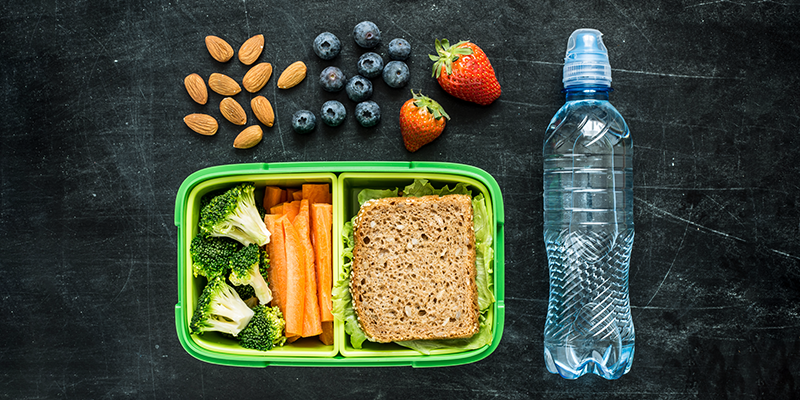 Providing portions of fruit and vegetables in every lunch pack will make sure they are getting the vitamins, minerals, and fibre they need. All chopped fruit and vegetables can be easily packed into small containers for the lunchbox, making them quick and easy to eat. If you want to slice apples and pears instead of packing them whole then rub a little lemon juice on them to stop the discoloration. Cucumber, carrot and celery sticks , mealies, snow peas, green beans, cherry tomatoes, red pepper strips. Dried fruit occasionally – raisins, figs, apricots or dates stuffed with nuts. Bread, grains and cereal foods provide important nutrients and energy for busy, growing children. Wholegrain or wholemeal varieties are the best choices. Wholemeal sandwiches, rolls, wraps, pita bread – gluten free where appropriate. Brown rice sushi – if your kids like sushi then making a pot of sticky brown rice and rolling it in seaweed leaves and filling it with crunchy vegetables is delicious and fun to make too. Chickpeas and kidney beans offer slow carbs and served in little pots with corn and red pepper can make a crunchy and tasty salad. Natures Choice is a vegetarian company, however, we do respect other people choices so we have included some options here that we feel are healthier alternatives. Cold chicken, tuna or any other oily fish like salmon or mackerel – either with a pasta salad or on wholemeal bread. Lentil patties (you can make many of these – cook and freeze – if you put them in the lunch box they will have defrosted by lunchtime. Cheese slices or cubes of decent cheddar. Soya yogurts are also an option or soya based products like soy sausages and patties. Nut butters provide both fats and proteins and when served with oatcakes or decent wholemeal bread make a nutritious meal. Try adding sliced bananas for added sweetness and energy. Seeds like pumpkin, sunflower, and sesame will provide protein and good fats – toasting them slightly will bring out their flavour but be careful not to overdo it. If your child tolerates dairy well then add small tubs of natural yogurt which you can sweeten with honey or fruit yourself. Avoid the fruit premade kind as it is packed with sugar. Avoid pre-packed snacks that are high in sodium and instead pop our popcorn kernels with coconut oil and flavour with our Nutritional yeast. It gives the corn a cheesy flavour and packs in loads of B vitamins and nutrients. Buy raw nuts and seeds in bulk and pop them into smaller reusable containers for convenience and a more economical option. Monday – Wholemeal Roll with tuna, celery, and raisins, chopped pineapple, toasted seeds, popped corn, homemade smoothie. Tuesday – Chickpea, mealie and red pepper salad, cheddar cheese cubes, grapes, Cashew and cranberry mix, Greek yogurt with vanilla and honey. Thursday – A wholemeal wrap filled with hummus and grated carrot, Apple slices with nut butter dip, dried apricots, boiled egg, homemade crunchie. Just spending a little time on the weekend planning your kid’s lunches during the week will make all the difference – and get your kids involved so that they can also learn and understand that in order to ensure healthy eating and living a little planning goes a long way.